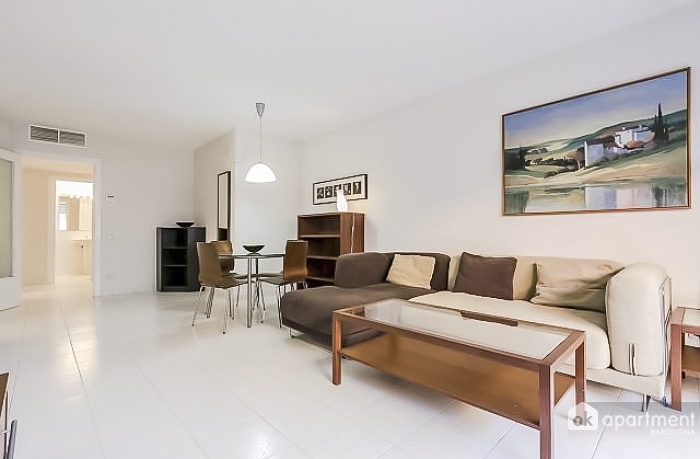 Cozy and bright apartment with a small terrace (10sqm) in the area of Sants-Montjuïc. This apartment of 80 m² is perfect for 4 people. It has two double bedrooms, a large kitchen (with fridge, oven, microwave, etc. ), a living room with TV, two bathrooms and flat. There are also washing machine, air conditioning and linen included in price. The building is practically beside the Parque Joan Miró and Plaça Espanya. You'll be very well connected with the rest of the city via public transport (metro-L3 and L1, railways and various bus lines) on the square. In addition you will have at your disposal a wide variety of shops and restaurants and the great Mall of Las Arenas. The enclosure of the Fira de Barcelona and Montjuic are also in the same area.